orange you glad you stopped by my blog? a) Work sucked worse than third period French last week. b) Wine Blogging Wednesday is not a lot different than Wine Drinking Tuesday or Grape Guzzling Friday at Chez Tami. There’s also the matter of my complete ignorance about French wines, red in particular. When I read the theme for this WBW, I dismissed it. I rarely drink French reds…and when I do, they end up tasting like pencil erasers to me. I happened to have this bottle sitting in my wine rack because – yes, I’m embarrassed – I bought it at the Dekalb Farmers Market because the bottle was different and caught my eye – Cellier des Dauphins Cotes du Rhone. When I thought this might fit the WBW bill, I looked it up online. It’s 85% Grenache and 15% Syrah. Should be yummy. I threw it in the ‘fridge to chill while I went on my run. I popped it open and tried it by itself. Eh. Sort of fruity and easy to drink. Then, I drank a glass with my beef stew. Yum! I tasted a little pepper and some cherry-ish fruit. At the price point – I think I paid $8 for the bottle – it could easily become a staple in my house for those red meat, no brainer meals. I buy for the labels too.Sounds good. 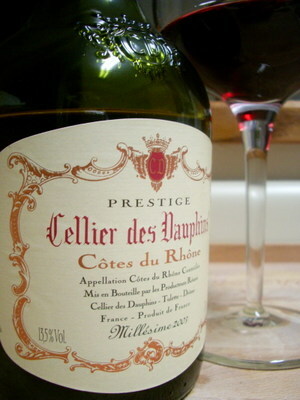 I love the Cotes de Rhone. We used to serve it at the french bistro i worked at. Good good good. I usually find it annoying to read others tasting notes, especially when the wine sounds like something I’d like, because I can so rarely find the wine being tasted. Thanks for including the source. I happen to shop at YDFM regularly so I’ll be sure to pick this one up.